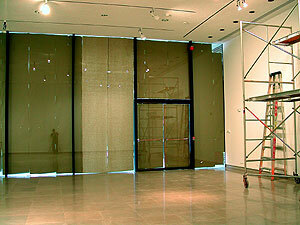 The Mirror Project | David Chien | Gusty Winds May Exist | Rice University Art Gallery, Houston, TX. Rice University Art Gallery, Houston, TX. This is only half of the 16' by 44' glass canvas I was expected to fill for my first ever solo art exhibition -- affectionately called Gusty Winds May Exist.